Th e building that is now Yarmouth High School was first ready for occupancy in September 1961. At that time, the building housed grades 7-12. The Building Committee for that project was Sumner J. Goffin, Chair, Buel Ferguson, Co-Chair Richard Boyd, Hamilton Grant, Norman Lindquist, Allen McCue, and Ralph Stevens. The cost of this building was approximately $960,000. In the principal's report at that time, he mentioned an enrollment of 232 students in grades 9-12 and reported that approximately sixty percent of YHS students were proceeding to higher education. Over the next decade, the enrollment was increasing steadily and in 1973, 626 students were enrolled in grades 7-12. Class sizes were growing unacceptably large, especially in the junior high school. These classes ranged from 26 to 32 students per class and it was clear that more space was needed. At this time, a series of additions to the building were undertaken, starting with the completion of an addition to the industrial arts wing. A new facility for auto shop and technical drawing were contained in this new section. In 1977, Principal Babino noted that "...the new addition to the library has been completed and is being utilized to its fullest by students and faculty. What a difference it has made in our school!" Space was still an issue and the principals' reports in the Annual Reports of the Town contain references to choral groups rehearsing in the sewing room and a principal taking a storage closet for an office. In 1980, a major addition to the southeasterly side of the building was completed. This additional space provided for a band room, weight room, several offices (we can assume that the principal made it out of the storage closet), a special education room, and two additional classrooms for the junior high school. A major change occurred in 1992 with the completion of the new Frank Harrison Middle School. The 367 students in grades 9-12 occupied the entire facility and further renovations were accomplished. Chief among these was the daunting process of asbestos removal. With the removal of ceiling grids, flooring, and lighting fixtures came high-pressure cleaning of all surfaces. When the project was completed, the high school had a fresh coat of paint, new ceilings, and lighting fixtures, and carpeted corridors. Following the renovations completed in 2003 we moved into a facility with the following centerpieces: a 500-seat auditorium, five new classrooms, an inviting student union/cafeteria, and a new office area that houses guidance counselors, the social worker, the substance abuse counselor, the athletic director, the nurse, and the administrative offices. At the present time, our enrollment is 534 students and approximately ninety percent of these students are going on to college and university study. There are currently fifty-seven teachers including all counselors, social workers, special educators, and technology/library specialists. 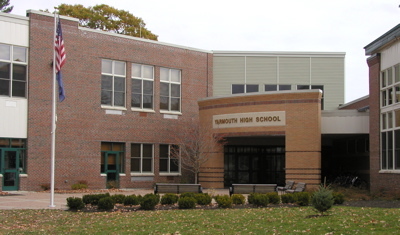 Yarmouth High School has long enjoyed a reputation as one of the strongest high schools in the state. The current facilities study represents our district’s continued commitment to providing facilities which meet the learning needs of our students and our community.